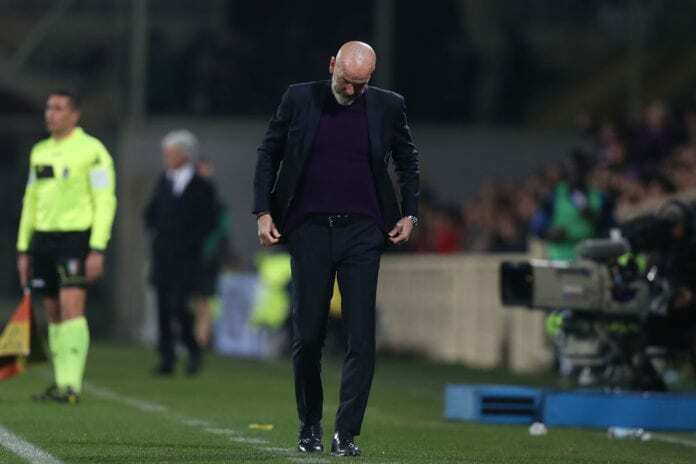 Manager Stefano Pioli still hopes Fiorentina can reach the Coppa Italia final following their thrilling 3-3 first-leg draw at home against Atalanta in the semi-finals. The Viola fell two goals down inside 18 minutes through Alejandro Gomez and Mario Pasalic before Federico Chiesa got one back for Fiorentina with Marco Benassi later volleying in an equaliser. Despite Marten de Roon restoring Atalanta’s lead in the second half with a 20-yard strike, Sevilla loanee Luis Muriel got Fiorentina back on level terms again by turning in Chiesa’s cross to settle things at 3-3. However, it puts Fiorentina at a dangerous disadvantage on the back of conceding three away goals as they chase their first Coppa Italia crown since 2001. “It was a very entertaining game and continually turning around,” Pioli told Rai Sport. “Atalanta did well to take their chances early, we deserve credit for staying in the game, pushing constantly and the real regret is the way we conceded the third goal. “Obviously we hoped to have more of an advantage from this home leg, but we still believe we have the quality and capabilities to get the result we need in Bergamo and reach the Final. During the game, Empoli's goalkeeper Bartlomiej Dragowski broke the Italian Lega Serie A saves record to keep a clean sheet. “Evidently 3-3 is our favourite result. It was an exciting match with two teams who like to play good, attacking football and so much quality on show. “We had sorted out the defensive situation on the first two counters, but Atalanta have a fantastic trident attack with great power, quality, technique and stamina. It’s no coincidence they are the most prolific side in Serie A. “We could’ve covered the spaces better in midfield, but with the way we play and Atalanta’s approach, there was always going to be an open game. “We’ve got the quality to cause Atalanta problems in Bergamo and many things can change over two months. We believe in our chances. The return leg between Atalanta, who beat Juventus 3-0 in the previous round, and Fiorentina will take place on April 24. The winner will then face either Lazio or AC Milan, who are both 0-0 on aggregate following Tuesday’s first leg draw, in the final of the Coppa Italia.